So I was trying to think of the last time I made Soup. It was so long, I had to look it up! 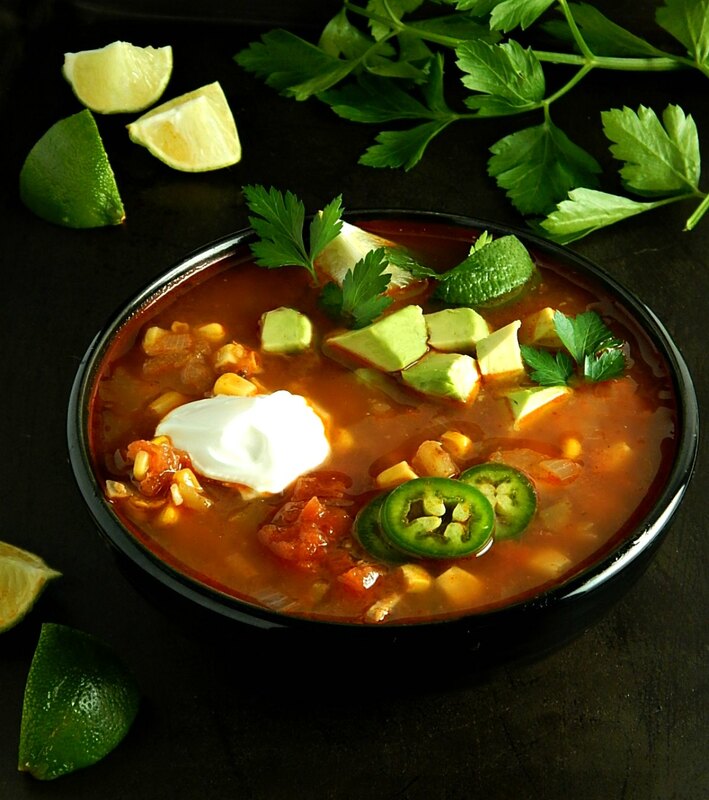 I made a White Chicken Chili that can be made in the Slow Cooker, Instant Pot or on the Stove in January, and it’s pretty soup-like but the last bone fide soup I made was in December: My friend Tanya’s Instant Pot Mexican Chipotle Chicken Soup. So I’m due! You, my friends, are due! I’m getting out of my Mexican soup rut and shaking things up with this Stuffed Bell Pepper Soup Instant Pot/Stove Top. If you follow me (and if you don’t, I’d love it if you do, see the right sidebar) you know I made Boston Sausage & Pepper Grinders right before Superbowl 2019. See the New England Patriots were playing the Los Angeles Rams (and the Patriots won) and I thought those “grinders” (that’s just the local name for sandwiches) would be perfect for the Superbowl or any game day, or really anytime! What’s not perfect? Leftovers. Leftover link sausages? They’re kinda sad. 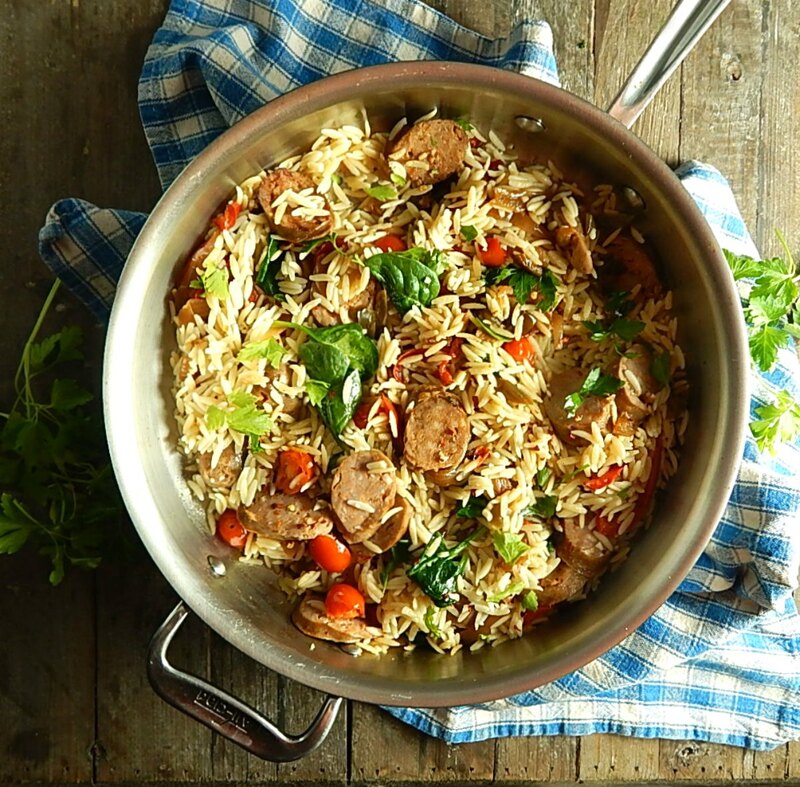 So I’ve refashioned them into Orzo with Sausage & Peppers. So Happy New Year’s, everyone! I can’t believe it’s New Year’s Eve, already! So what do you do for New Year’s Eve? Me, I’m kind of an old curmudgeon. I mean back in the day I’d go out with the girls but these days I’m usually perfectly happy to stay in, stay warm & safe and maybe stay up till midnight. I’m not sure what made me think of this old-fashioned recipe…I’d call it comfort food. I don’t think I grew up on it, but it was always around at someone’s house. I remember making this way back when I was a young Mom. 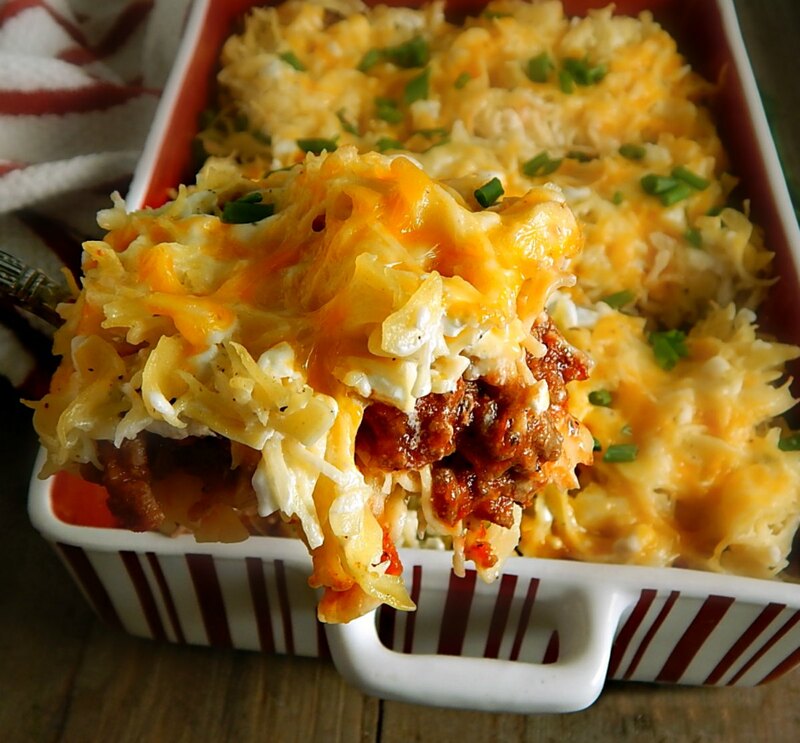 I always called it Ground Beef Noodle Bake. I suspect it has roots in the German Kugel but became “casseroled up” in the U.S., much the way our “American Goulash” did. I was chatting with my friend Tonya on facebook book the other day. 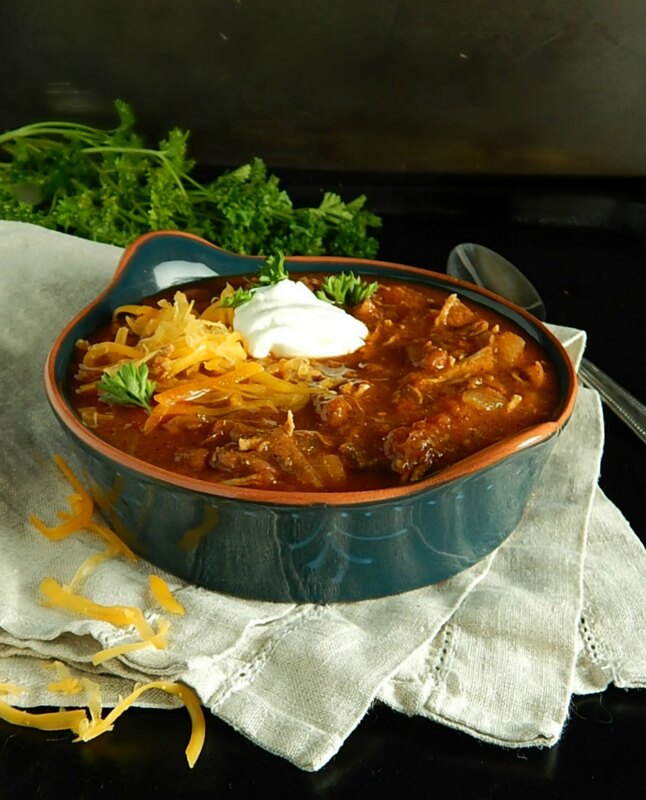 I asked if she’d made anything great in her Instant Pot and she gave me this recipe, Instant Pot Mexican Chipotle Chicken Soup. This soup saved my life! Thanks Tonya for sharing! 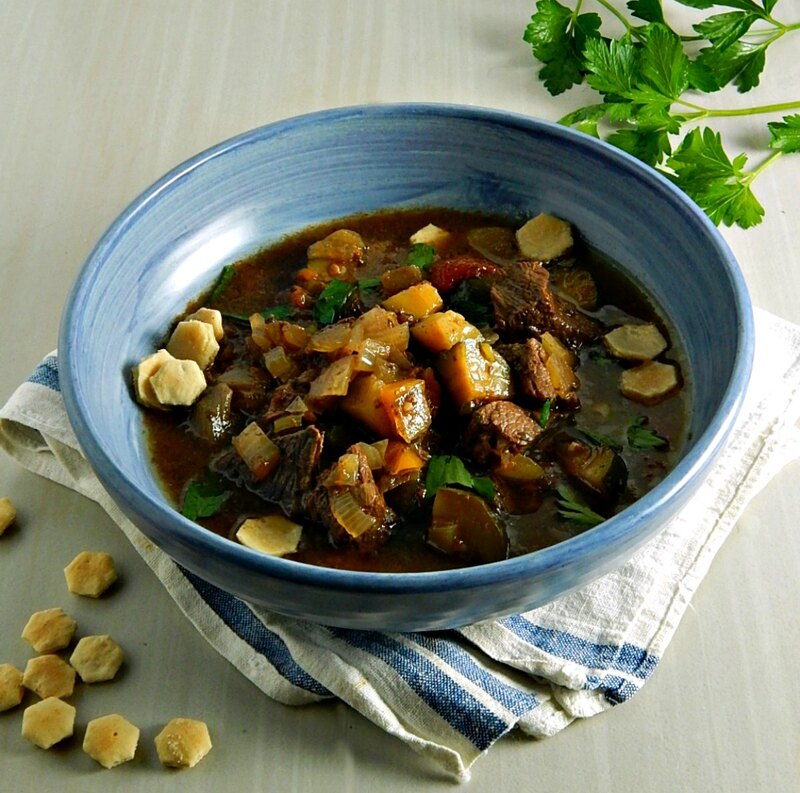 Slow Cooker Zucchini Beef Soup has got to be the perfect end of summer soup, especially if you happen to have a garden still spitting out zucchini! Here in the Twin Cities, I’m still seeing a few on my neighbor’s plants. Me, I know better than to ever plant zucchini – the plants never stop and you’ll have zucchini out the ears, lol! My little cherry tomato plant has been a bit stingy, probably because I just put it in a big pot and kind of left in the northeast corner of my back steps for the first half of its miserable existence. Then I tossed it out where there’s some good southern exposure. It was a shock for him. But finally, he adjusted to the August heat and started putting out! So I decided to make Oven Roasted Green Beans & Cherry Tomatoes. I’ve been on a bit of a Meditteranean kick. I’m trying to health up the rest of the summer, at least until Labor Day comes. Besides it’s August and it’s hot and it’s humid (whine whine whine) and I want to eat (and cook) cool and light. 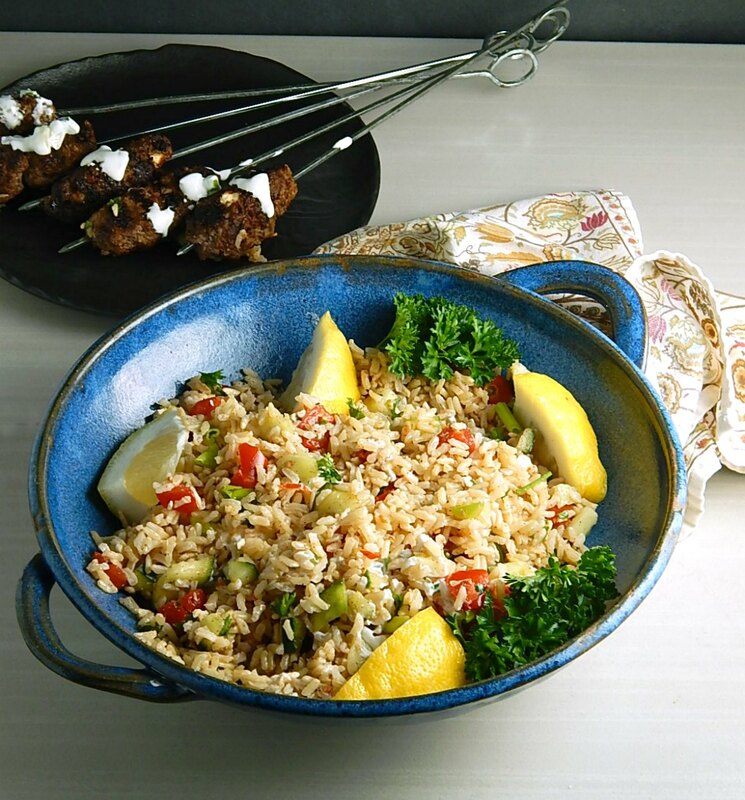 And so I made Greek Brown Rice Salad to go with my soon to be posted Spicy Beef & Feta Skewers. 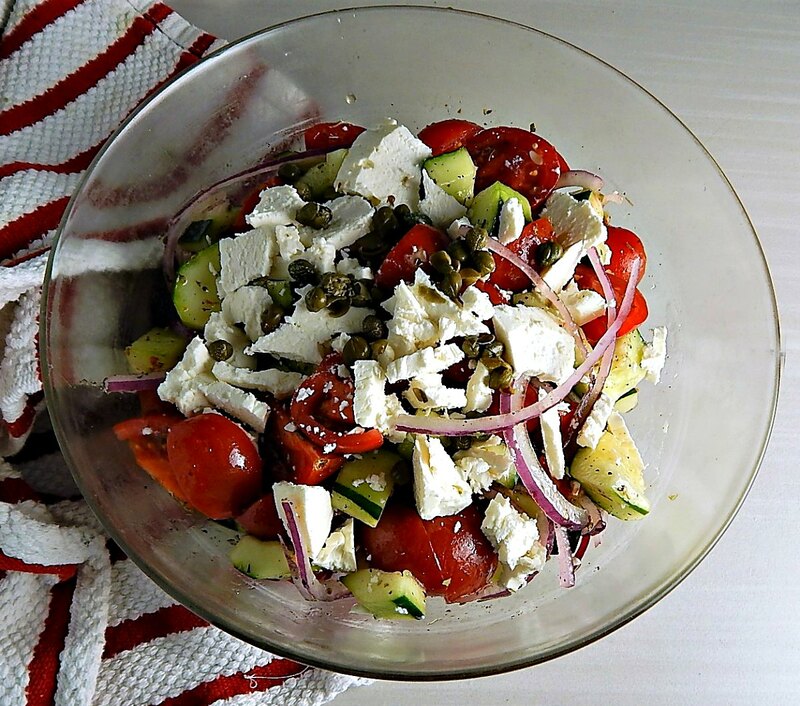 I just did a post for Horiatiki Greek Salad not too long ago. Gosh, that was good. 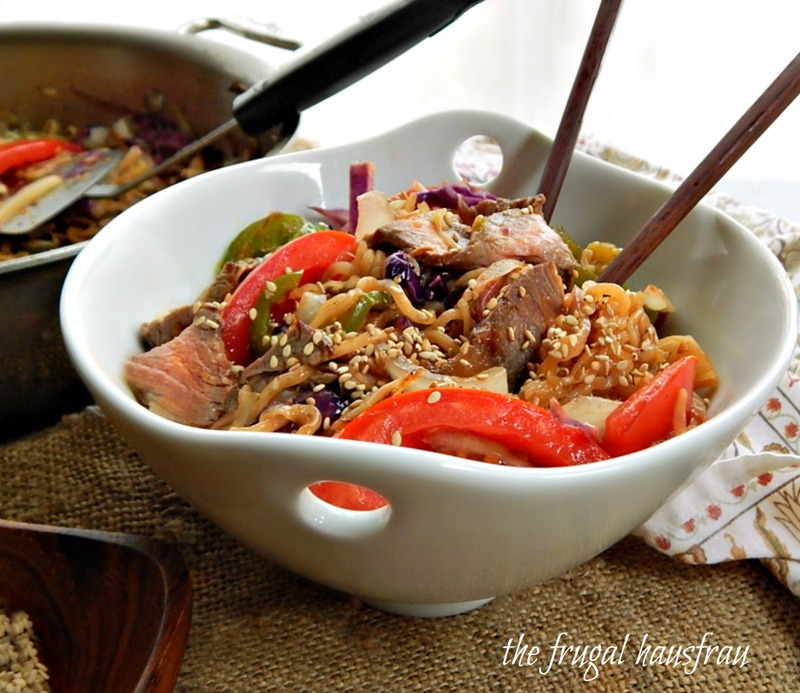 And I wanted to carry some of those flavors forward with a little twist. 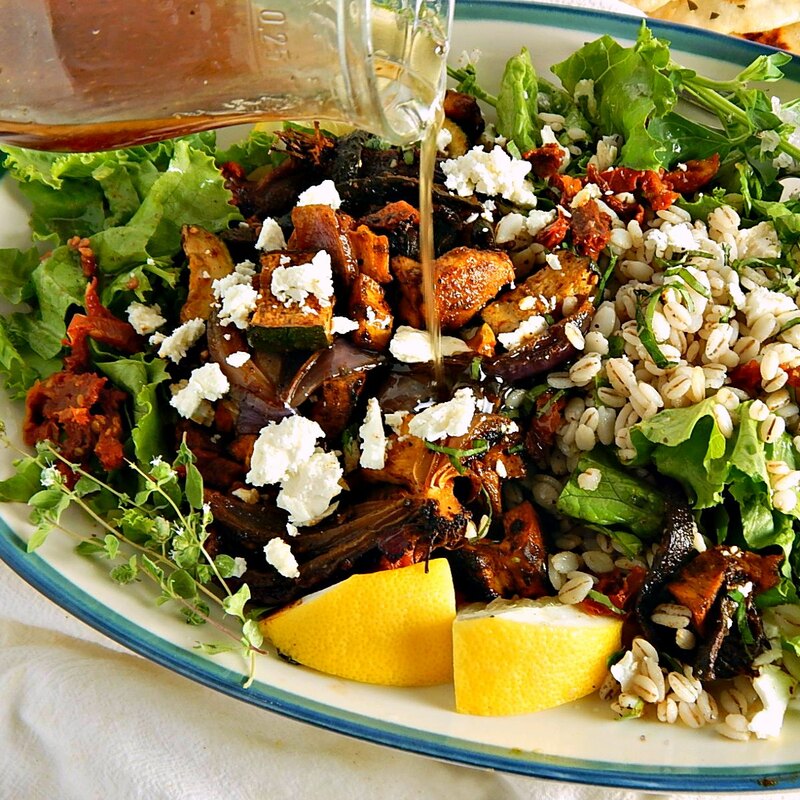 Funny how I listed so many variations of our American Style Greek Salads, but I didn’t mention or think about combining it with rice, let alone brown rice. A bit of cooked Barley was the “by-product” of my Healthy Lemon Ginger Barley Water recipe awhile back. Well, if you know me, you know I try to waste nothing, and sure didn’t want to waste a morsel of wonderful, chewy, nutty Barley. (I love it, and so should you, btw! It’s really good for you!) 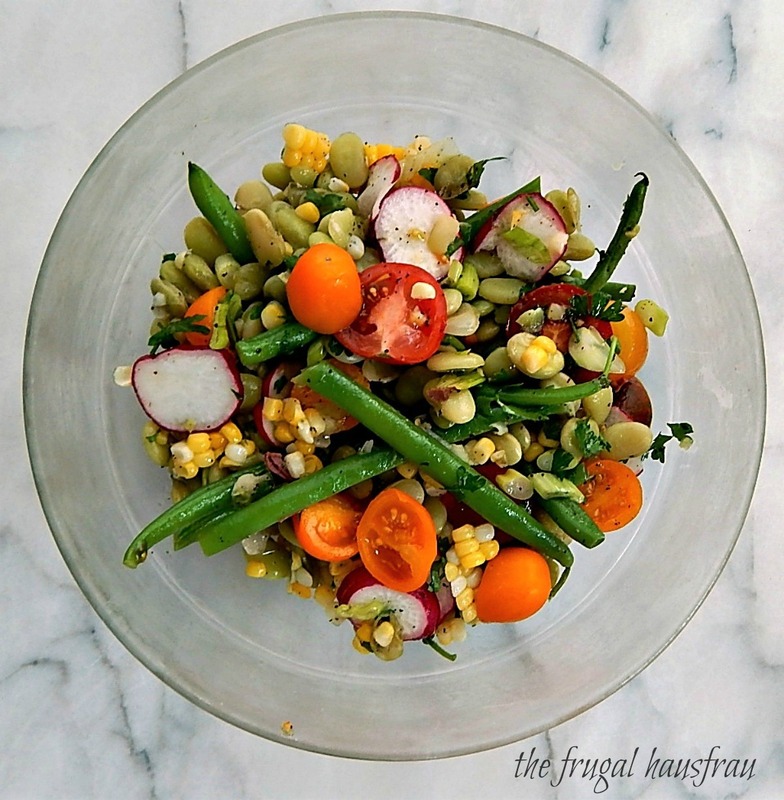 And so I went on a quest and that quest ended in this Salad with Smoky Sheet Tray Roasted Vegetables & Barley. It’s a lot to use a cup of Barley, huh?! 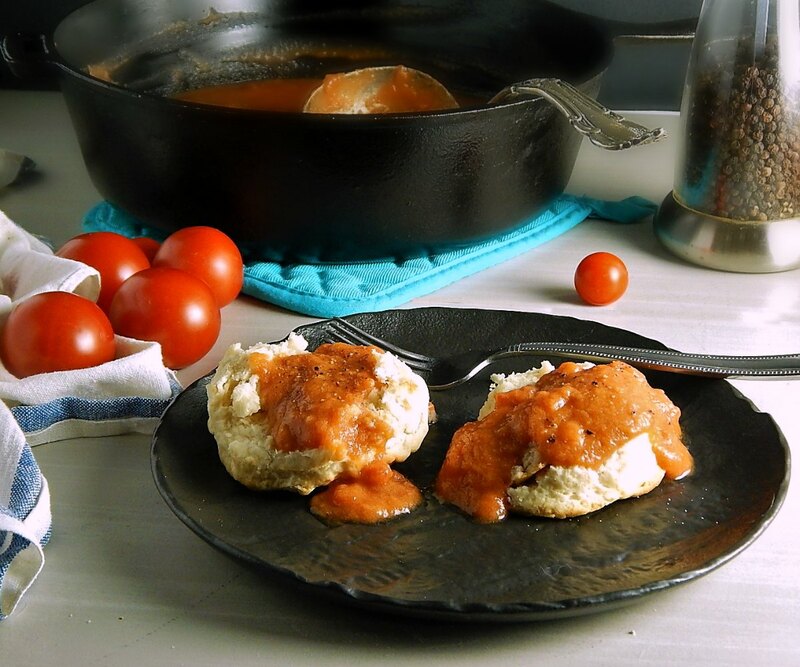 I don’t know who to “blame” for me whipping up this Southern Tomato Gravy the other day. Certainly not all my family that has migrated down to Georgia because I have never had Southern Tomato Gravy at their homes nor heard the words Tomato Gravy pass their lips. I knew it was going to be just the thing to go over the leftover Biscuits I made the other day, though. 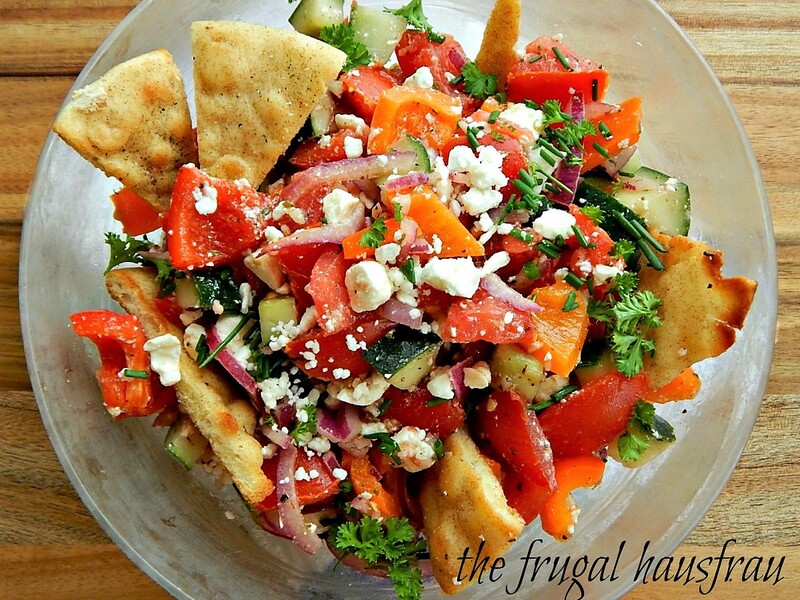 I can hardly wait for the summer tomatoes to make big, gorgeous salads. And this one qualifies. 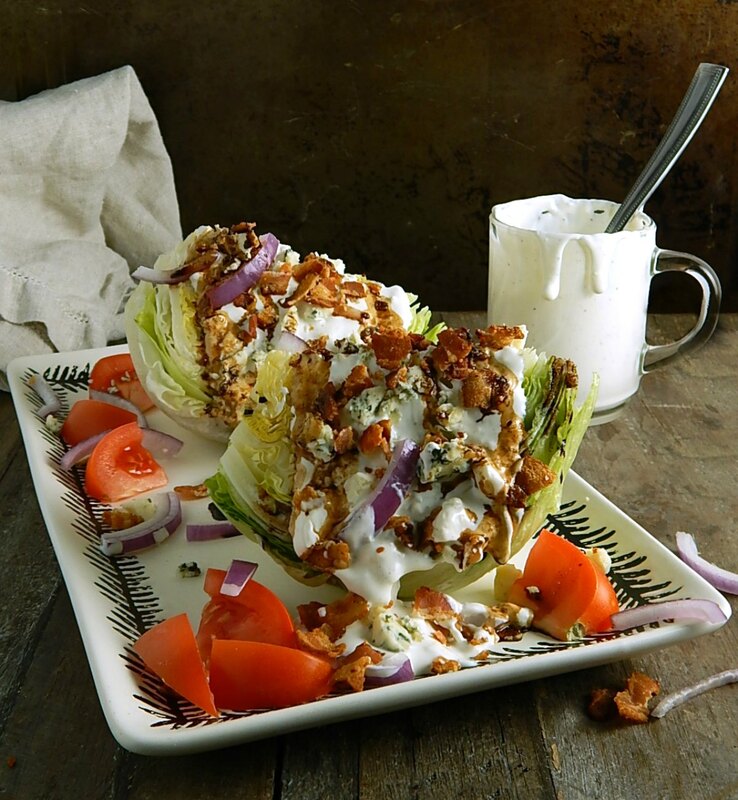 It’s a straight up play on the classic BLT…behold the Bacon Lettuce Tomato Salad. 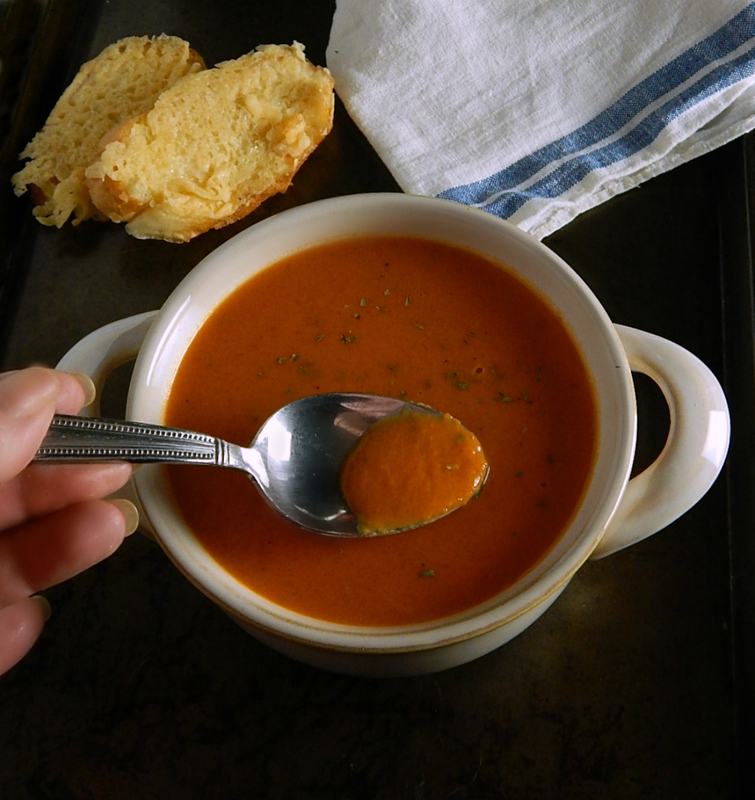 Every once in a while I crave Tomato Soup and this Simple Tomato Soup Instant Pot or Stovetop is a great one to whip up at the drop of a hat. Here’s a new to me soup that you might like, too. Yucatan Pork Stew Instant Pot or Not. 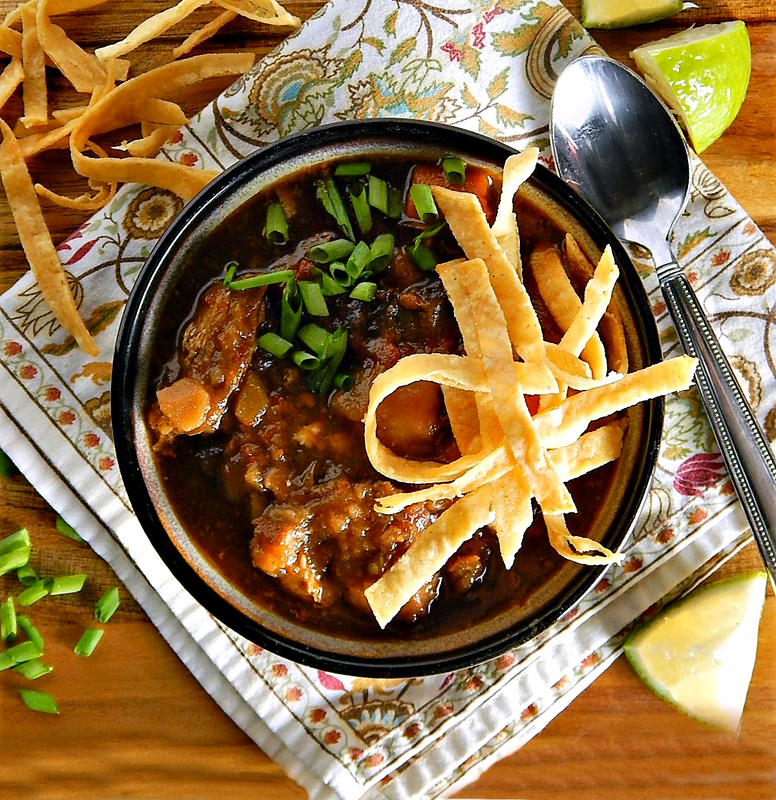 You might be familiar with Taco Soup or Sopa de Lima. 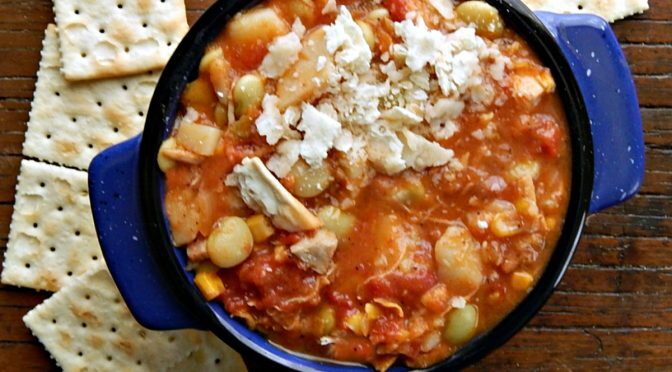 They’re kind of relatives & share some of the same qualities as this Yucatan Pork Stew Instant Pot or Not. Now that summer is just about here…we hope…it’s time to think about those snacks we’d like to have out on the deck on a balmy evening. Chips and Salsa, I’m thinking. 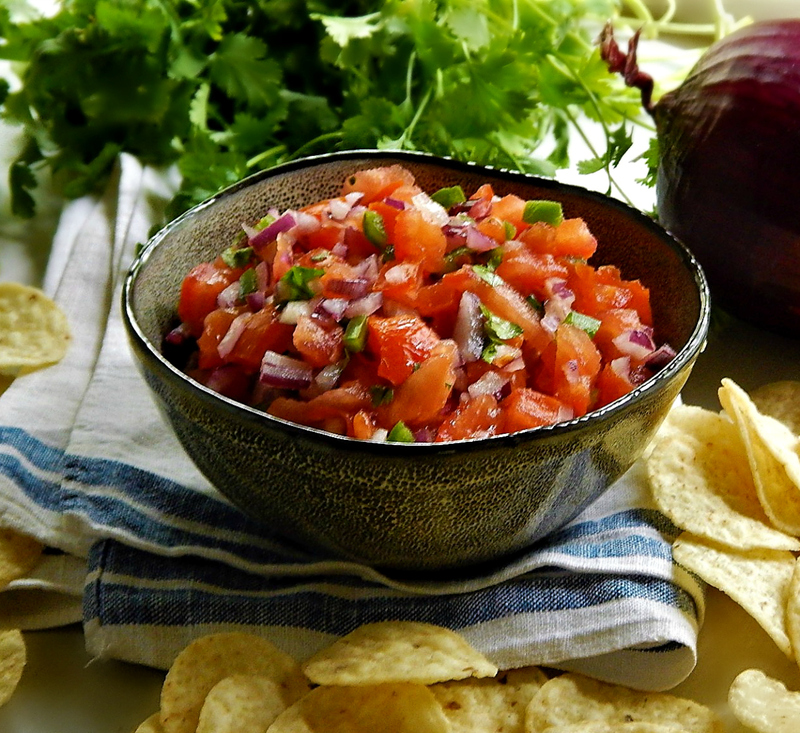 And one of my favorite summer recipes is a Salsa Fresca, a classic Pico de Gallo. Particularly Chipotles Classic Pico de Gallo Salsa. Maybe even with a cold, slushy Margarita. But that will have to be another post. I have a thing for Cabbage Rolls and try to make a pan of them every year. 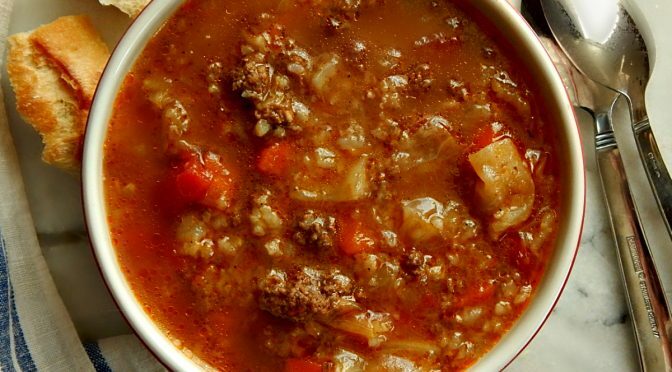 This year, though, I decided to “roll” all those flavors into Instant Pot Cabbage Roll Soup, instead. 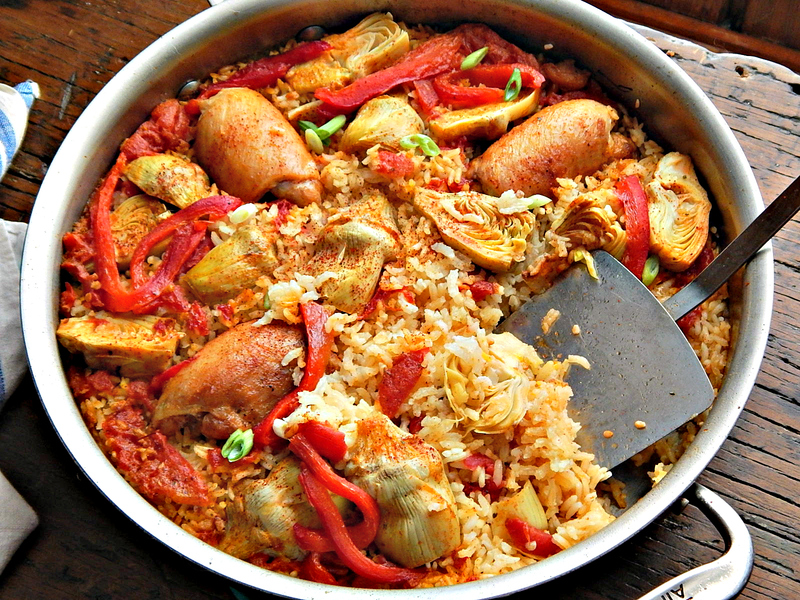 No worries if you don’t have an Instant Pot because the stove-top instructions are here, too. If you follow me, by now you’ve probably noticed I have a passion for Mexican food. And maybe you do, too? 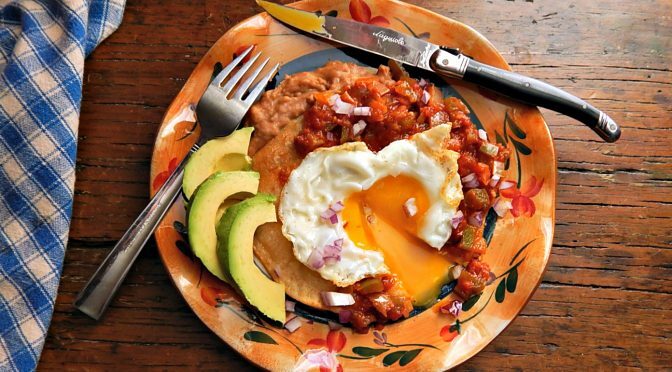 So when I started thinking about Cinco de Mayo coming up and Mother’s day right after, I couldn’t help but think of the classic Huevos Rancheros. Make that Huevos Rancheros! With an explanation mark! 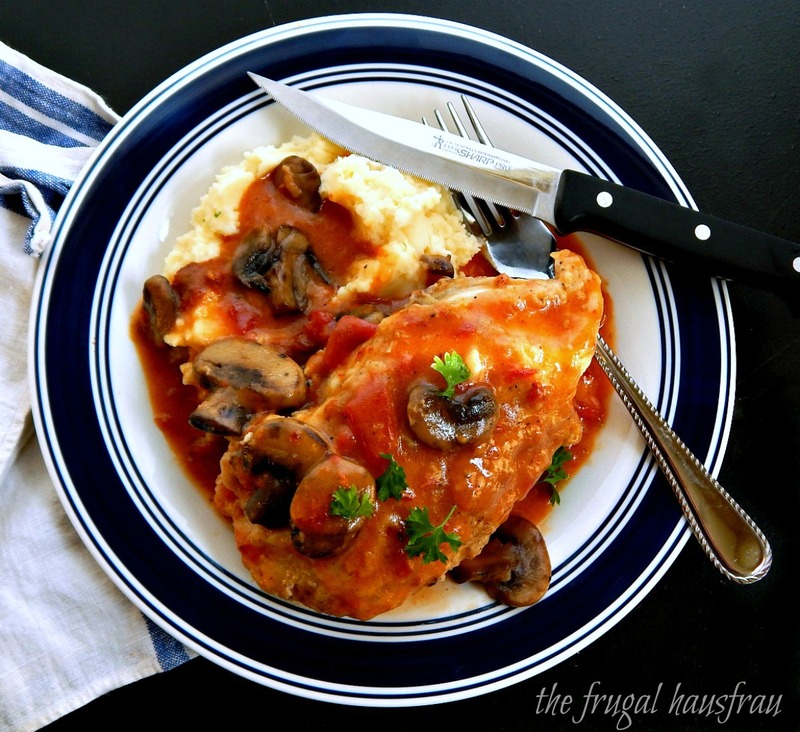 I have really fond memories of this recipe, Chicken Bordeaux from the New York Times Cookbook. At least Chicken Bordeaux was in a New York Times Cookbook in the early ’80’s. In Craig Claiborne’s day, I think. This harks back to when I was young, and if the pictures are correct, wearing a bikini! 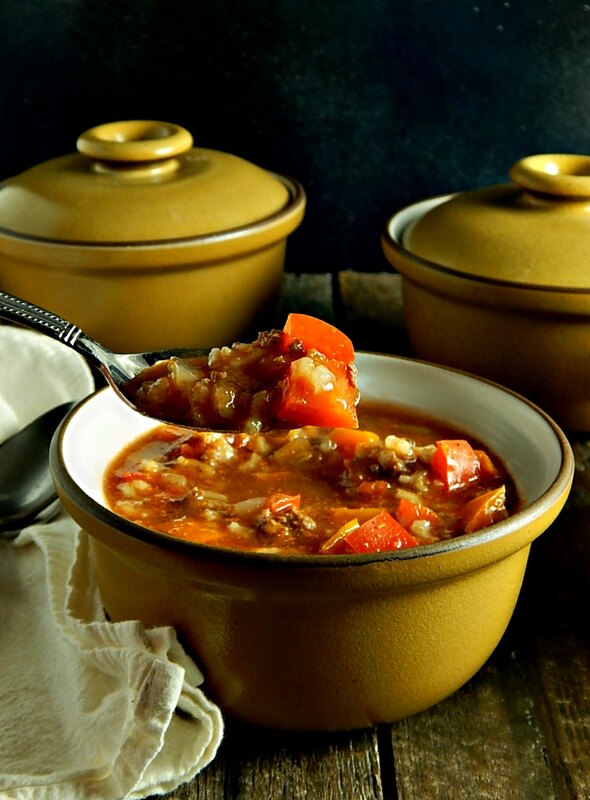 How do I know about Brunswick Stew Virginia Style? Back in the ’70s, we went on one of the very few family vacations that didn’t include dogs (My Dad raised Goldens and showed extensively), probably to try to instill some sort of family bonding combined with patriotic zeal to renew our faith in Family, God, and Country. My sister told me about Cornbread Salad. I mean, really, if she hadn’t raved, I never would have made it. I think she MADE me make it and report back, lol! I fell in love with it. Hard. Strange ingredients, but it’s like a miracle. 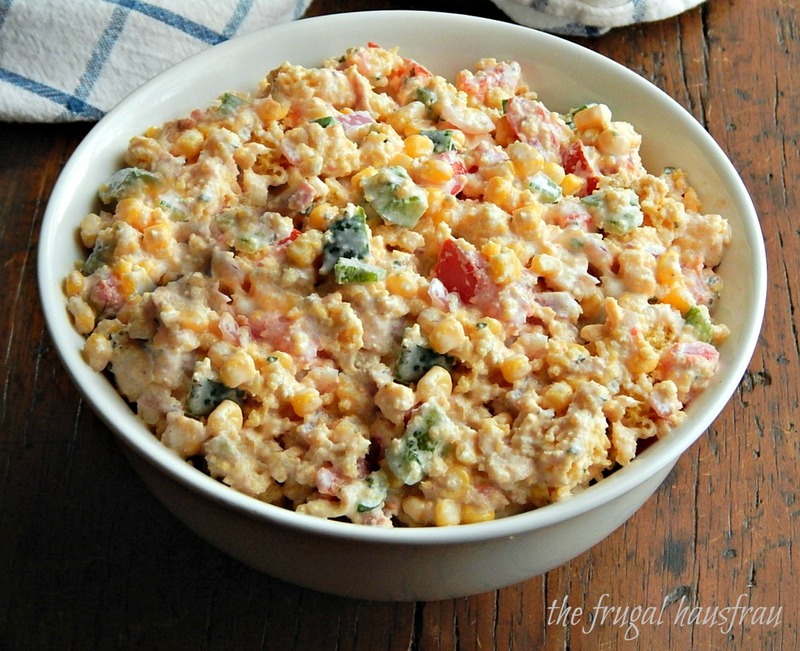 The miracle of Cornbread Salad. 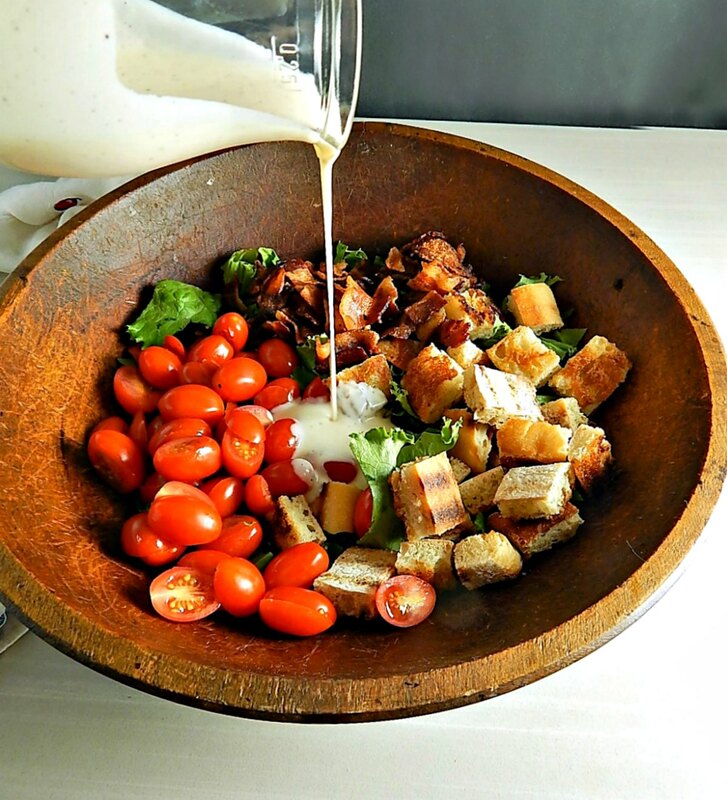 Cornbread Salad: Talk about AWESOME deliciousness! It’s been about a year since I last posted a recipe for a Panzanella – that would have been during our last glut of tomatoes. This year I wanted to change things up a bit and go Greek style. We’re finally getting some cool days and that means the tomatoes in our little garden will be slowing down. I snuck a few to make this very easy Rustic Tomato & Cararmelized Onion Galette. So they’re finally here. Tomatoes. First one, then three, now nine – all from our little garden. As you can see, they’re multiplying exponentially! 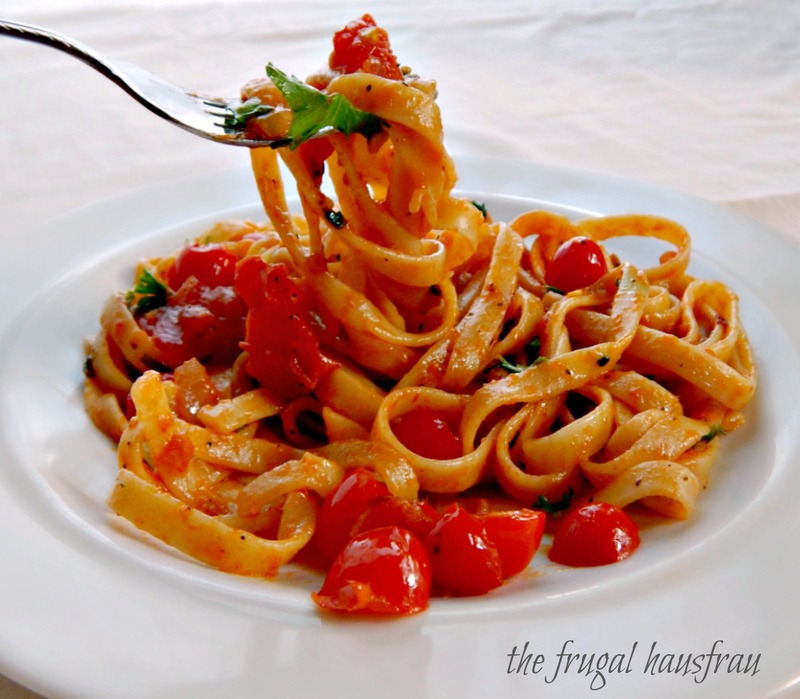 But even if you don’t grow your own, you’ll find great tomatoes this time of year, and great tomatoes make the best Fresh Tomato Pasta.